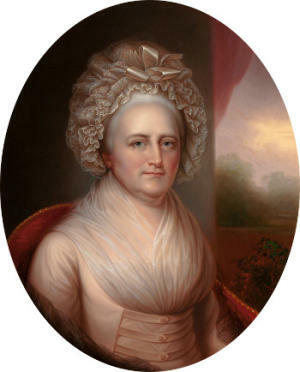 Martha Washington was born Martha Dandridge in 1732. At age 18, Martha married Daniel Parke Custis and the two had four children together, only two of which made it to young adulthood (the oldest, John Parke Custis, lived to be 27). Daniel passed away in 1757, leaving Martha widowed at the young age of 25. Two years later, Martha married 26-year-old George Washington, a Virginia tobacco farmer and military man. The two never had any children together, but George treated John Parke and his sister Martha as his own. In 1777, George had been leading the fledgling Continental Army for two years in a war against Great Britain when he set up winter quarters for his men in Valley Forge, Pennsylvania. 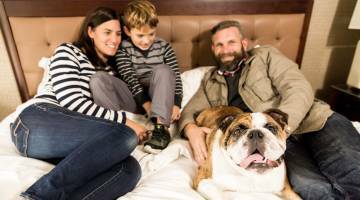 Martha traveled 10 days and hundreds of miles to join him at the stone house he used as his headquarters. On February 22, 1778, Martha Washington helped organize a celebration for her husband&apos;s birthday. Martha baked her husband a cake for what was the first public celebration of Washington&apos;s birthday, the advent of today&apos;s Presidents Day holiday (Valley Forge still celebrates with a cake based on Martha&apos;s original recipe. Read more about it here). Martha spent much of her time at Valley Forge socializing with the wives of other officers who also made the trip to the Philadelphia countryside. She also joined in recreational activities with her husband including attending a camp play and taking part in the celebration of the French Alliance. George Washington led the army out of Valley Forge on May 19, and he and Martha parted ways once again. She would never be far from her husband, though, as she became the first First Lady of the United States and stayed with George until his death. Martha passed away in 1802 at the age of 70.